Forgiveness is not a pre-requisite when it comes to resolving violent conflict in a world blighted by blood-stained power struggles. You certainly don’t have to forgive and you absolutely need never forget the sometimes hideous atrocities perpetrated by those, who brandish their cause as a justification for unspeakable acts of violence…but even then, pathways to peace still exist if courageous people are prepared to walk them. Dialogue, compromises and pragmatism can replace bullets, bombs and bloodshed, facilitating peaceful co-existence across the face of the globe IF warring factions would just come to their senses. This was the essential message from a remarkable and most unlikely alliance when Martin McGuinness, ex-IRA Chief of Staff and now Deputy First Minister of Northern Ireland, shared a stage and a common agenda with Colin Parry, father of 12-year old Tim Parry killed by an IRA bomb in Warrington in 1993. As one would imagine Colin and his wife Wendy were left devastated by the loss of Tim – after all no parent should outlive their child, but this truly remarkable couple were determined that their son’s death would not be in vain. 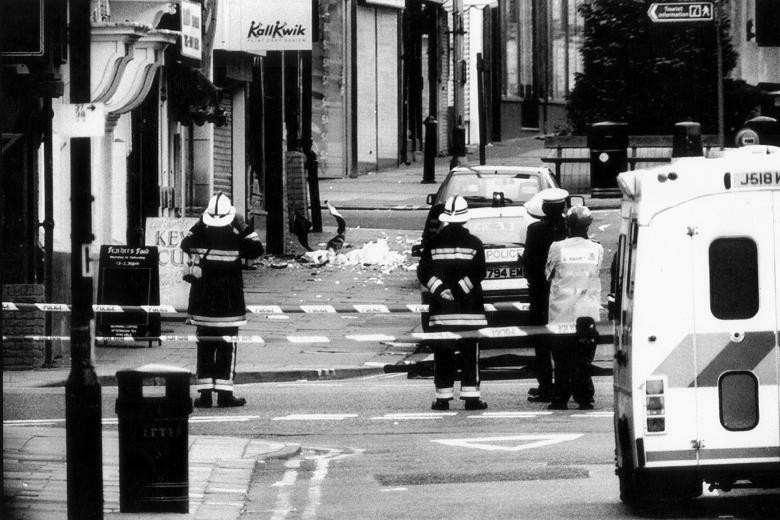 Tim was fatally injured and Johnathan Ball (aged 3), was killed instantly, when bombs planted in litter bins in Warrington’s main shopping area were detonated shortly after midday on a sunny spring Saturday afternoon. No warning was given and no one has ever been prosecuted for the outrage on March 20, 1993 – explosions that also left 56 people injured. Johnathan’s parents Wilf Ball and Maire Comerford, sadly now deceased, were as one with the Parry’s in bearing their dreadful loss with extraordinary bravery and fortitude. Like Colin and Wendy, they vowed to make their overwhelming grief count for something more than just another tragic statistic in the conflict in Northern Ireland – the oft described ‘Troubles’ – which claimed the lives of more than 3,000 people men, women and children. 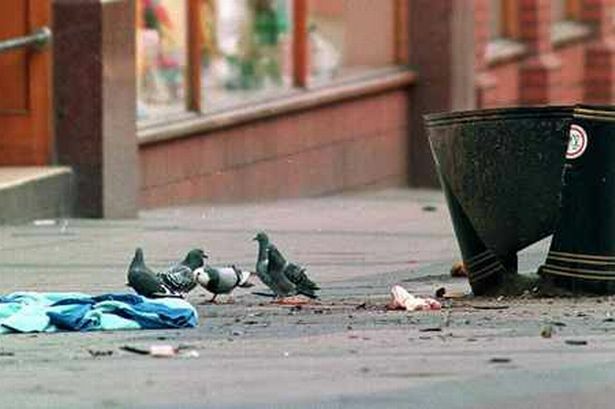 The proverbial phoenix, that rose from the carnage and murderous mayhem of that most awful March day, was a turning point in the seemingly endless violence waged by warring Republicans and Loyalists alike – with the British Army and Royal Ulster Constabulary trying in vain, to control and contain the spiralling savagery and destructiveness that epitomised this venomous struggle. The deaths of the two innocent boys marked a sea-change in the conflict with the consensus of opinion on both sides of the Irish Sea being ‘enough is enough’ – something just HAD to give, something HAD to change for the better. 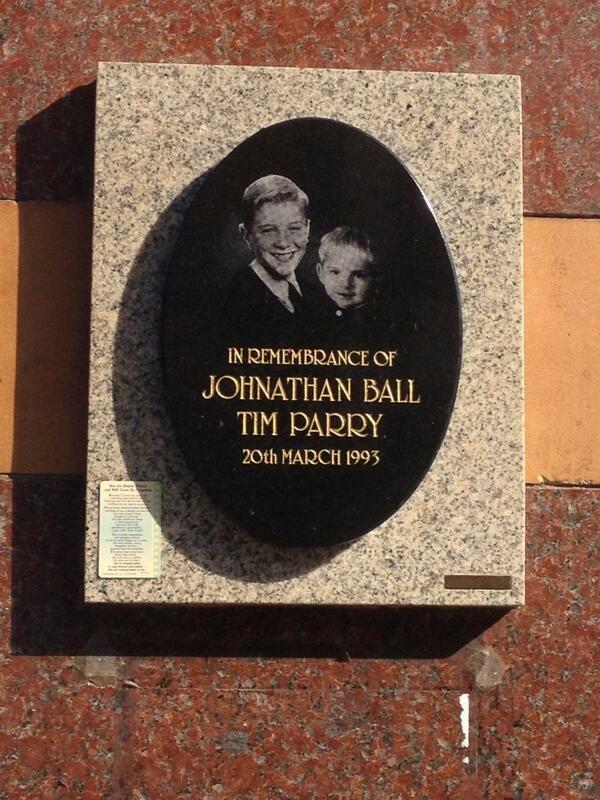 In 1995 the fledgling charity, the Tim Parry Johnathan Ball Foundation for Peace, was born as a lasting memorial to the boys. Not only that, it was founded to symbolise hope and promote the processes whereby disputes could be successfully resolved without a need for violence. Five year later, such was the success of the burgeoning charity, the Foundation had the wherewithal to open a bespoke £3million, Peace Centre in Warrington and accelerate its efforts to advance peace building and reconciliation in conflict areas all over the world. Fast forward 13 years to the present day and the 20th anniversary of the bombing of an innocuous town in Cheshire and the painful trauma of remembering the loss of two young lives. But, amid all the sadness and anguish, a beacon of hope and enlightenment burns bright, in the aptly named Peace Drive in Warrington. It was here in the Peace Foundation building that Colin and Wendy hosted Martin McGuinness, having invited the man who would have sanctioned numerous IRA bombing missions and consequent murders in his time with the Provisional Republican Army, to come and talk…about peace. The invitation – condemned by some and certainly viewed as controversial by others – was freely given and swiftly accepted – as the Parry’s continue their crusading work to make the world a better place – a safer environment – for anybody and everybody irrespective, of political persuasion, religion, colour or creed. Mr McGuinness was Sinn Fein’s Chief Negotiator in the complex, delicate and hard fought negotiations that resulted in the Good Friday Agreement – the accord between the British Government, Irish Republican factions, Loyalists and para-military groups – effectively ending more than three decades of ‘civil unrest’ in which the ‘Provos’ waged all out bloody war on all aspects of British society. 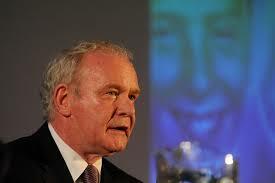 On the same topic Martin McGuinness said: “I don’t expect anyone to forgive me for being in the IRA. I have no right to ask for forgiveness. Both men from different sides of the spectrum were in tacit agreement that forgiveness, as laudable and desirable as it might be, is not essential when it comes to the crunch of resolving violent conflict. Putting forgiveness to one side in order to achieve what would be perceived as a greater good cannot come easily, but the Parry’s are living proof of what can be achieved – against all the odds – if there is a desire, a passion and a determination to create good from evil, conjuring peace from war. Reflecting on what he refers to as a ‘journey involving much hurt and pain’ he says it would be hypocritical to deny his involvement in the IRA. History shows that at the start of 1972, at the age of 21, he was second-in-command of the IRA in Derry, a position he held at the time of Bloody Sunday, when 14 civil rights protesters were killed by British paratroopers in the city. “As a republican leader it would be hypocritical of me to seek to distance myself from the consequences of armed struggle or the IRAs role in it. At the age of 63, Martin McGuinness is both a father and a grandfather and his admiration for the parents of the two boys killed seems genuine, albeit he persists throughout in counter balancing the loss of innocent lives to IRA acts of terrorism, with those who died at the hands of the British Army or the RUC. “There can be no greater tragedy in life than parents having to bury their children. The deaths of children during the conflict is a responsibility that we must all bear, irrespective of being British or Irish. That responsibility rests with anyone engaged in armed organisations. “No child whether they were killed with a plastic bullet fired by a British soldier or RUC man, or killed by an IRA action or by a loyalist gang should have died. When quizzed on what finally made the IRA move towards a unilateral ceasefire, Mr McGuinness said it was the realisation by both the Provos and the British Army, that neither side could defeat the other via military means. He said the Warrington bombing created an ‘imperative’ because of the strength of feeling among people, the sheer disgust at the death of the two boys and the wave of popularist opinion that screamed out to the men of violence that a peaceful solution just had to be found. It’s a momentous step for anyone to take in the most testing and stressful circumstances but, if it is taken, if visionary people can see the potential within their grasp, there are unimaginable benefits to be reaped. Undeniably, The Warrington Peace Centre, has, and continues, to do just that. Colin Parry spoke of life being about choices, the choices we all make as well as the choices denied us. “I had no choice but to hold my son as he died. I had no choice but to carry his coffin and I had no choice but to lower him into his final resting place. Citing the example of a young peace activist in Northern Ireland who came under huge pressure from both family and friends to join the IRA after his sister was killed in the mid 90s, Mr Parry spoke of how he had been inspired. 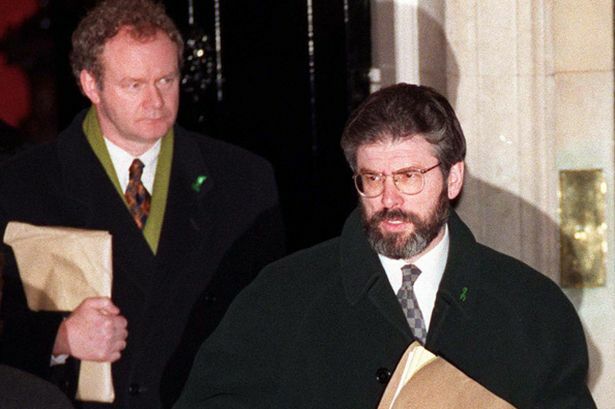 The Foundation is credited by many – Martin McGuinness included – as having made a significant contribution in securing the peace in Northern Ireland, but its role and influence is by no means limited to the Irish conflict. “We have earned the credibility to be a serious player in seeking conflict resolution, not just in Ireland, but anywhere in the world. You have to bring victims and perpetrators together – how else can you change attitudes and enhance understanding? 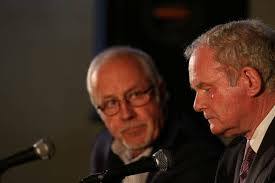 Messrs Parry and McGuinness are as one in their conviction that solutions exist for any conflict no matter where it’s happening – Iraq, Afghanistan, Syria, the seemingly never-ending Israeli predicament – being obvious instances that spring readily to mind. Mr McGuinness held resolute in his beliefs when he said: “The past cannot be allowed to destabilise the future, rather it must inform our path to a better future. “Dialogue, building trust and making political compromises are the seeds to achieving new beginnings. Compromise is not a dirty word – I am proud of the compromises I have made in the pursuit of building peace. Describing the Warrington Peace Centre as a ‘beacon of hope for the future’ Mr McGuinness endorsed Colin Parry’s approach of engaging with all relevant factions in violent conflict, saying Peace needs Partnership. And, when it comes to those partnerships they can come in the most unlikely of guises, where forging a new peace and a better world is not dependent on either forgiving or forgetting the injustices that have gone before. © 2015 Right Word Comms.